glass cleaner 4 It was good. But I was not sure what to use a cloth or what. I had to clean my windshield a couple of times. The glass cleaner works really well 5 I have used other glass cleaners on my car windows, but it seems like all they do is move the film o the windows around. They look pretty good until I pull the car out in the sun and them you can see every streak where I wiped. With the McKee's window cleaner, it cut through the film and removed the film. When I pull the car out of the garage now the windows are clean, clear and streak free. I like the idea I can use it on my window tint also. Streak free cleaner! 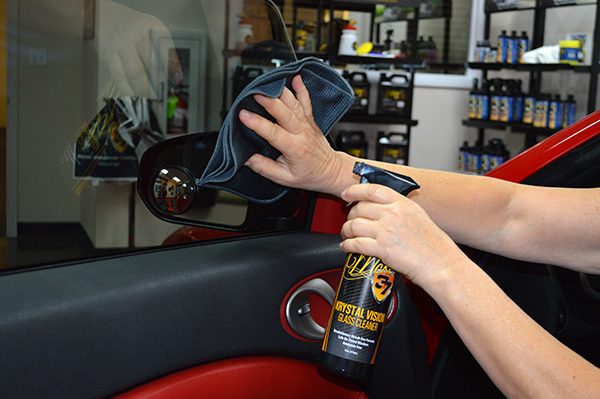 5 Tested this product out two ways, first on a very dirty windshield with rain and road construction film built up on it and secondly on a window I washed with car soap but didnt rinse and allowed to dry while I dried the rest of the car. The product worked great in both cases! I did about half the windshield with 4 sprays and it removed the rain/film and then did a second application of just 2 sprays to make sure it was spotless! To my surprise it removed all the dirt and left no streaks/smudges, just Krystal clear glass. The dried soap film came off with ease as well just a few sprays and it wiped away. Best of all it has little to no smell so wont leave a scent when used on the interior. Ill be buying a gallon next time! Impressive Glass Cleaner! 5 I received a bottle of Krystal Vision Glass Cleaner as part of a "Mystery Bucket" purchase. When I pulled this out of the bucket my initial thought was "I have so many cleaners on my shelf thats failed to impress me - hope this one is a keeper". The interior of my windshield my most hated area had smudges and smears way down by the dash that was really bugging me, so I gave Krystal Vision a shot. Would it perform better than Stoners which *was* my pick of the litter Well, I'm here to tell you that Krystal Vision worked perfectly right off the bat. Easily cleaned the interior windshield in one go...ONE. There was no need to go back at it to hit a missed streak or smear. Color me IMPRESSED - M37 Krystal is now my pick of the litter. Best glass cleaner I have ever used 5 Always a PITA trying to get clean smudge free glass. Removing all that road grime used to give me a real workout and often very frustrated at results. This one works even better than the ad says. Removes everything and no smudges. Pros:Removes everything and leaves a streak free window. Krystal Vision Glass Cleaner 5 Not every glass cleaner is created equal, Others grab the glass dry out and cause streaking. Krystal Vision works wet so it does not cause those dry out streaks. Very easy to use. Could not believe it.... 5 Cleaned my car windows without any problem. Never thought a product would actually do what it promised to do....amazing. Will never use any other cleaner....GREAT!! !